Economics can be a complex subject for students to learn. One way to teach them new concepts is by using concepts they are already aware of. This lesson uses the scientific method as a way to explain the economic model. Chances are that those taking an economics class have already had at least some experience using the scientific method and this will put economics on a level they can easily understand. To begin with, ask students to tell you the steps to the scientific method. In general terms the scientific method can be grouped into four steps. Pose a problem based on observations. Decide on a possible answer to the problem. Decide which variables need to be used in order to prove the answer to the problem. Test the use of these variables using experiments and available data to apply to the problem. Explain that this method can be used in economics as it is in science. An economic problem is the first step, then the possible solution is proposed. Once the solution is proposed, information must be collected in order to test the solution. Once the information is collected, the model is created and tested. To help students understand the economic model, ask them to discuss possible problems and the solutions to them in the economic world. A list of possible topics is included below. Why is the unemployment rate so high? What can be done to change this? Should the cost of shoes be standardized? What impact would this have on shoe companies? If everyone drove the same type of vehicle, what impact would this have on gas prices? When discussing these problems with students, be sure to ask them what information they would use to prove their solutions. What variables should be considered? How can the solution be proven? After the discussion is over, hand out the worksheet included with this Introduction to Economics Lesson Plan. Ask students to complete the project using a situation they have or are able to create. The situation should be a realistic one even if it is one the student made up. 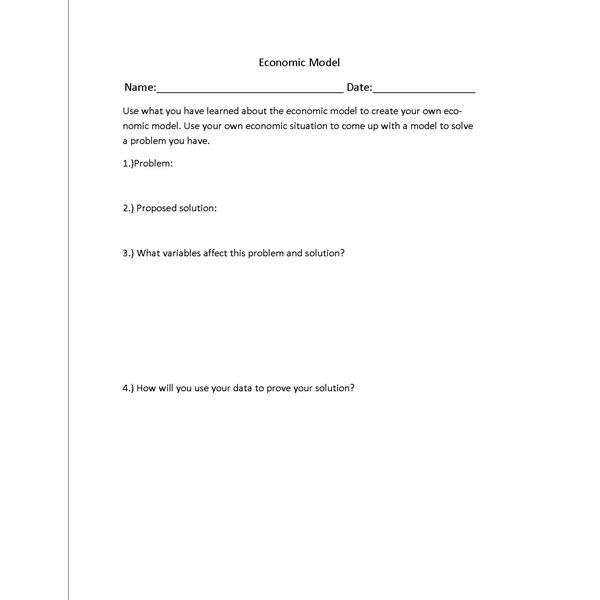 The Economic Model Worksheet will provide students with hands on experience using the economic model in a way they can understand in their own world.